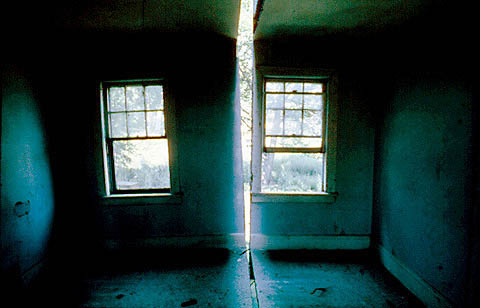 [Image: From "Splitting," by Gordon Matta-Clark]. "A 43-year-old German decided to settle his imminent divorce by chainsawing a family home in two and making off with his half in a forklift truck," Reuters reports. The man then "picked up his half with the forklift truck and drove to his brother's house where he has since been staying." The police seem less than outraged. "The man said he was just taking his due," one of them stated. (Read more about Gordon Matta-Clark in BLDGBLOG's Museum of Assassination). Actually, it wasn't the "family home", but the garden shack, as can be seen here. Oddly enough, he took the house, but left the furniture. Genius or madness - you decide. Off-topic, but these images of German industrial buildings in the early 20th century may be of interest. I particularly like the Einsteinturm, that seems to leap straight out of the Weimar Republic into a Miyazaki film or manga. Less counterproductive than burning the house down, which happened to my wife's aunt and uncle: They were going to go look at a house to purchase, but the house was no more. The embittered hubby had burned it down!